Recently, a good friend of mine made a suggestion to me about my work. She told me to delve more into myself to see what I can find. Most of my inner most thoughts and feeling are generally expressed through writings that I refuse to share. I find them to be too personal. When she suggested that I paint my deepest thoughts and feelings, the first artist that I thought of was Frida Kahlo. I figured that my work would look somewhat like hers--if I were to interpret it literally--although her work wasn't necessarily literal. I'm sure that my work would involve some gore and possibly some sordid symbols and madness. ...but there's another artist. 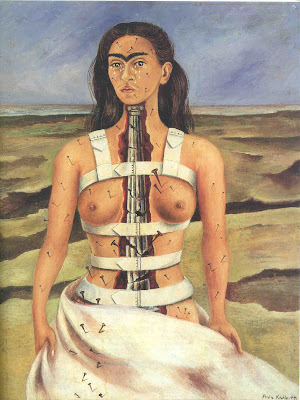 One whose work speaks just as clearly as Frida's, but is more masterfully rendered. It speaks to the darkness that lie within many of us, the darkness that we sometimes won't allow others to see. It is the painters' truth--his vision. 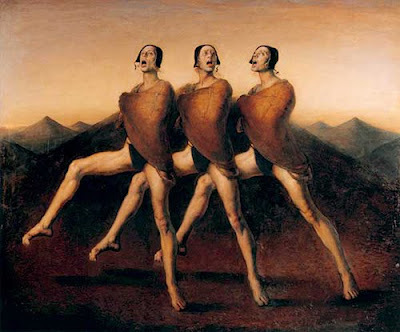 It is ODD and he is ODD Nerdrum. I was introduced to his work some years ago and thought that he was a classic artist that I had never heard of, but I soon found out that he is of our time, although his paintings are classically inspired. His subject matters--well, let's just say they are ODD, but I can appreciate him as I do Frida because they speak their truth in their work--always. So I decided, that I will make an attempt to delve, and we will see where it takes me. In the meantime, I'm inspired by his work--thoroughly. I suppose he doesn't want to get lost in this idea of modernism where painters have put money and fame before true purpose. That's my interpretation, but I do understand how easy it is to get lost as an artist. Kitsch is the opposite of the public space, of the public conversation, of the demand for objectivity and functionality. Kitsch is the intimate space, our selves, our love and our congeniality, our yearnings and our hopes, and our tears, joys and passion. Kitsch comes from the creative person’s private space, and speaks to other private spaces. 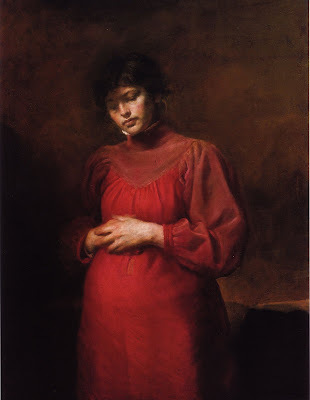 Kitsch deals therefore with giving intimacy dignity - Odd Nerdrum, ArtNews, April 2000. I love finding articles about my work. I guess it just shows me that folks are paying attention. That's a good thing for a growing artist. I suppose my narcissism makes me want to post everything that I see. lol! Here's an article written in 2008 by Ultraviolet Underground. I thank them for their kind words. The work of Tamara Natalie Madden offers a reality both muted and vivid that is just touched with the kiss of the fantastical which makes her paintings both stunning, curious, and tragic at times. The sadness and pride within many of her subjects turns a tale that could easily be told without depth or sincere detail, into a view of humanity that stays with you long after the first sight. It would be difficult for one in touch with their heart to not want to sit and stare into the worlds she's cast so adeptly upon canvas. Recently, I was interviewed by Chris-Tia from Thank God I'm Natural for Natural Chic of the Week. She recently wrote a book about natural hair. You can find more details on her blog here. I didn't particularly like the picture she chose for me, but I'm re-posting the article here anyways. I changed the picture to something that fits more of my personality. The original one is on the bottom. She’s a Leo. She’s no nonsense, and being natural is literally, in her roots. Growing up on the tiny island of Jamaica, 34-year-old Tamara Natalie Madden was raised around family who embraced all things organic. But her road to naturaldom incurred a few bumps and even Jheri Curls, but hey, we all fall. But successfully growing and maintaining her locks is just a minor accomplishment for the painter. One of her biggest success stories came after she received a kidney from her brother after experiencing kidney failure. 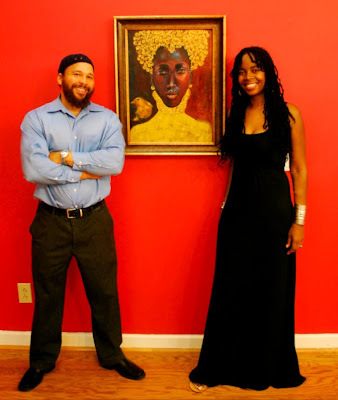 The second lease on life not only gave her the courage, but also the drive to become a full-time painter, creating inspiring portraits of African American men and women. But don’t think Madden’s pieces can be purchased any old where. All her creations are one of a kind and will cost anywhere between $500 and $4,000. What keeps the bills paid? I grew up around naturalists in Jamaica and by the time I was 19 years old, I was feeling the urge to get rid of the process. My uncles were Rastas and my grandmother used to wear long plaits. My aunt cut my hair into a short afro when I was 12 years old because there was really no way to maintain a process in Jamaica. My hair was natural until I was 14 years old and back in America. My mother gave me a Jheri curl then, and it was horrible! Eventually, I ended up with the process again! I was tired of the back and forth to the salon to get my hair straightened. I was really tired of the smell in the salon—all of those chemicals woo! That drove me crazy! I was also really tired of looking like everyone else. I wanted to be free–I wanted to be me. I never felt fully comfortable with a relaxer. When I chopped it off, I was bald! I felt like a new woman! I didn’t lock my hair until 2004. What advice can you give to those going from relaxed to natural hair? Don’t compare yourself to other people. Try not to worry about their opinions. Throw away ideas and thoughts that would deter you from going natural. Move at your own pace and do what you have to do to take the step forward. Some people go for the gusto and chop it off; others wear braids, wigs, extensions, etc. You have to find what works for you. Just embrace your true self. I know it’s difficult to break away from all that we’ve conformed to, but you will feel free, that’s a promise! Ok. Dish on some of the products you absolutely heart to death. I don’t use a lot of products in my hair, but I do like using natural oils to keep my hair moisturized. There’s a product called Aura Glow and I like to use that on my skin and in my hair. I also like natural shampoos, no particular brand. I wash my hair either every few days to every few weeks or whenever I feel like I need to. It’s very long so I generally wash it in the shower. Sometimes, if I want a color, I use Henna Hair dye to darken it. Henna can be messy, so I have to be careful not to dye my skin! I oil and twist my hair and usually braid it up when it’s wet so that I can get my crinkles. My hair is much longer when I leave it straight. The crinkles give my hair a little fullness and body. What are your favorite hair styles? With long locks, I can do almost anything! I usually just wear it down, but on some occasions I like to put it up. I always wear a bang. It’s not very common to see people with locks wearing bangs, but I wanted to do something different. Any of the higher ups have something to say about your mane? No. I suppose because I’m an artist; people aren’t surprised that I’m natural, but my hair has nothing to do with my profession. I would have been an artist regardless, but I think that the full experience of cutting my hair and embracing my true self enhanced me spiritually, thus affecting the type of art that I produce. So how do the dudes dig your do? Men love my hair, now. When I wore an afro, I found that fewer men were interested. I was always attracting militants for some reason. Now, I find that all types of men are attracted to me. I always wonder if it’s because my hair is long. I’ve had several guys tell me that they have never dated any woman with natural hair, but the length and upkeep of my hair made it easier for them to view me as a potential mate. It was pretty weird to hear someone say that to me, but everyone has a right to his or her opinions and preferences. How do your peeps feel about your rambunctious roots? My true friends accept me as I am. When I initially cut my hair off, I lost friends. I remember driving down the street with my BFF, maybe sometime in 1999 when we were confronted at a red light by some ignoramuses’ who shouted berating things to us about our afros. One of them attempted to hand us a comb through their car window. Needless to say, we sped off, but that was the general reaction I received from all types of people. The only consolation we received was when Lauryn Hill became popular—it was then and only then that we became somewhat cool because of our hair. My mother and extended family thought that it was a phase. My mother was a pristine, conservative, fair-skinned Jamaican woman–anything unkempt and disheveled wasn’t in her realm of understanding. Needless to say, my hair wasn’t her forte. Who is your hair muse? No one now. I really liked Vanessa Williams. She was dark and had long locks and was sort of a role model for me. It was inspiring to see an African American woman wearing her hair natural in Hollywood! She recently went back to a perm. I think she felt that her hair inhibited her — blah! That saddened me a bit. I’m an artist! That’s my fun. I do it for a living and it’s the best job in the world! It’s my true passion. Aside from that, I like photography and I spend a good amount of time doing that, as well. I also enjoy writing, but most of my writing is very personal. I enjoy all things creative and of course I enjoy modeling! It’s a fun way to express myself as well! 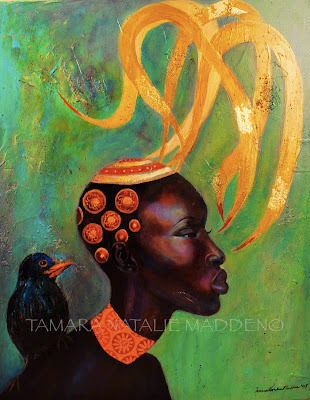 Visit my website and check out my art, www.tamaranataliemadden.com and look for my work in the December/January edition of Upscale Magazine. Laura Izibor! 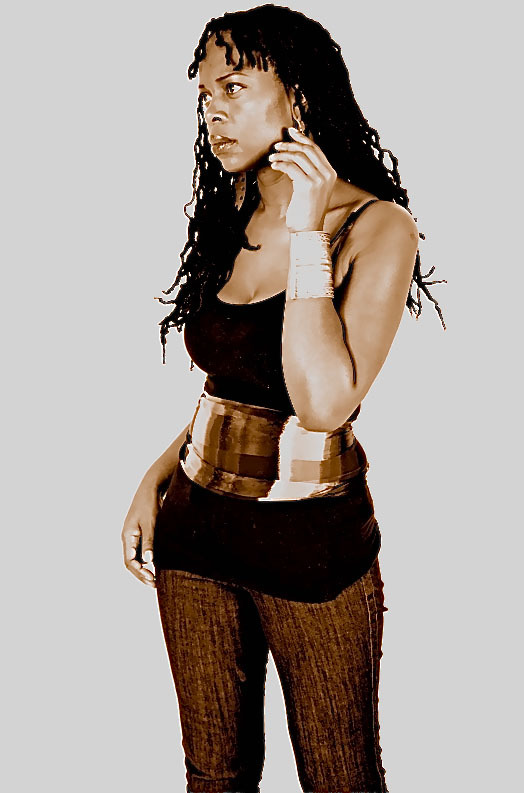 Love love her CD.I also have Sizzla, Bilal, Adele, Portishead, Buju Banton, Jah Cure and a myriad of other wonderful artist on my Ipod. Thank you Tamara for your time and for showing us how to keep it chic and stay natural at the same time. Until, next week. I haven't been updating my page. I think that I've gotten way too busy for my own good! I did a show back in June in NC. It was a fairly successful show, although the opening was horrible. I just thought I'd share some of the images from that experience and the write-up that their local journal did about me. When Tamara Natalie Madden came down with a rare disease, her kidneys failed and she underwent dialysis three times a week. 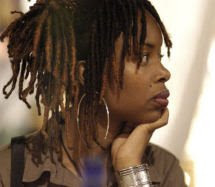 The dialysis sessions began around 1997, shortly after Madden gave birth to her daughter. Each one kept Madden hooked to a machine for three or four hours -- and wondering how to keep sane in the process. She did so by drawing sketches for a children's book and by developing ideas for her paintings. Madden's struggles with kidney disease ended happily in 2001 when a half-brother from her native Jamaica gave her one of his kidneys. And shortly thereafter, she entered some of her artwork in an exhibition, making good on a promise she had made to herself long ago, namely to become a professional artist. 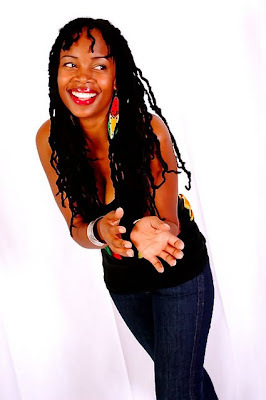 Madden, a single mother in her early 30s, was born and raised in Jamaica. During her teenage years, she began living with her mother in the United States. The positive outcome of Madden's disease -- coupled with an unusual way of portraying everyday folk on canvas -- can be seen in "Majestic Women: Paintings by Tamara Natalie Madden," an exhibition that Winston-Salem Delta Fine Arts Inc. is presenting through July 25 at the Delta Arts Center, 2611 New Walkertown Road. Madden now considers her half-brother her "brother." But she barely knew him when, "on a whim," she and her mother traveled back to Jamaica to reunite with family. "He thought I looked ill," Madden said recently on the telephone from her home in suburban Atlanta. "He asked me what was wrong, and I told him. He offered a kidney to me.… That's the kidney I have right now, that's keeping me alive." Madden the artist has never forgotten this unexpected gesture of benevolence. In each of her works, there's a bird that represents what her artist statement calls "a sense of freedom." "Dialysis … made me feel as if I couldn't budge (and) I felt imprisoned by my illness," the statement reads. "When I received my transplant I no longer felt like a caged bird. I was free to pursue my joys and my passion. Each bird represents that sense of autonomy, that feeling that you can achieve anything through hard work and dedication." The other singular thing about the work in Madden's Delta Arts exhibition is the way she has transformed the everyday folk in her portraits into what she calls "kings and queens." The portraits' subjects run the gamut, from homeless people to modestly paid workers at a variety of companies. All of the subjects in "Majestic Women" are black, and despite the show's title, a few are men. For "Majestic Women," Madden has painted portraits derived from photos she took of each subject -- and then "clothed" the portraits with colorful patches of fabric in such a way that each has taken on a regal air. This process depended on the cooperation of the portraits' subjects -- something that Madden wasn't always able to secure for a variety of reasons, including their desire not to be photographed. One person who did agree to be photographed for a portrait in the exhibit was Nicole Pritchett, 37, who works as a fabric developer for a clothing company in the Atlanta area. She said that Madden wants to "uplift with her work" -- a goal she seems to have fulfilled with Pritchett. "I felt, ‘Wow. Maybe, I could become a queen in my next life,'" she said. The idea of transforming everyday folk into kings and queens came to Madden after she discovered that people "weren't moved by the images" in her paintings of everyday Jamaican folk. She came to believe, thought, that if you "take a person you might overlook (and) put them in these clothes, then they become acceptable." "You're forced to sort of look at them and appreciate them," she said. Dianne Caesar, Delta's executive director, agreed, saying, "You're compelled to come look at them." Sharif Bey, an assistant professor of art education at Winston-Salem State University, also sits on Delta's board. He said he recommended a Delta exhibition of Madden's work, after seeing it in a show at Syracuse University. "It deviates from conventional portraiture by incorporating several media," Bey said. 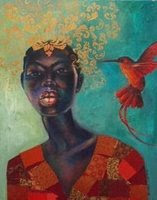 "Majestic Women" has also reminded him of similar developments in the Harlem Renaissance, when artists worked to "combat negative images of blacks from the 19th century." Curiously, Madden has never received any formal training in art beyond a few classes in high school. She is finishing work toward a bachelor's degree in business management, believing that talent in art only gets you so far, that "you have to understand the business of art" to make it as an artist as well. Though she acknowledges that school can be helpful for an artist, she seems content to remain largely self-taught. "I feel I can really express myself without limitations. I don't feel like I have to follow in anyone's rules and guidelines. I'm free. I'm not limited." 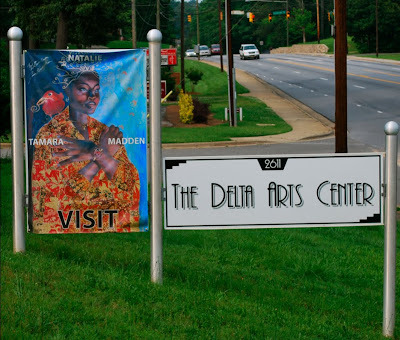 ■ "Majestic Women: Paintings by Tamara Natalie Madden" will be presented through July 25 by Winston-Salem Delta Fine Arts Inc. at the Delta Arts Center, 2611 New Walkertown Road. Gallery hours are 10 a.m. to 5 p.m. Tuesdays through Fridays and 11 a.m. to 3 p.m. Saturdays. Admission is free; for more information, call 722-2625. ■ Ken Keuffel can be reached at 727-7337 or at kkeuffel@wsjournal.com.